Detailed and systematic advice is always required for entering into such agreements and is vital to protect the rights. We know that NRIs have the right to buy commercial or residential property in India. There is no limit to the property they can buy. However they can’t buy agricultural land or farm houses or even plantations – neither can they accept be gifted these. But they can acquire the latter in inheritance. There are various aspects that need to be comprehended and adhered to, as far as property issues are concerned. It is imperative therefore that they have full knowledge and assistance on this issue and understand how to remain protected from any harassment. However, overseas citizens don’t always find it easy to travel back and forth to sort out such issues hence the importance of the Power of Attorney in India. An individual need not be a lawyer to be granted the right to act on somebody else’s behalf. The method in which it would finally be brought to an end should be clear so that no ambiguity is there on this. It is a universally accepted fact that all documents relating to a POA must be interpreted strictly with due assistance by law-It is assumed that the POA grants only those rights as are specified in the document. This can grant considerable access to the third party to take any action on your behalf. This involves the drafting papers which assign to another person the authority to be your representative. It is better to frame this kind of a document under proper lawyer advice. As a general precaution, remember to give a Restrictive Power of Attorney, wherein the powers of sale are not given. It is always better to give one that is Title specific. Each case would require judicial interpretation based on the facts and circumstances of that particular case. Before you sign, you should take help from appropriate lawyers and consider who you choose and also whether any time limit needs to be imposed on the power granted. The lack of properly drafted and executed documents can lead to a lot of complications in case an individual gets incapacitated due to severe illness or injury rendering him unable to travel, unable to make decisions or manage financial and medical affairs. Due to ignorance of the law, people fail to make a proper document. All formalities should be completed while the Principal is competent, alert and aware of the consequences of his/her decision. This can be effective immediately upon signing or only upon disability. The person who empowers is the Principal, and the person who is empowered is the Agent. The Revocation deed should be properly formulated so that in the case of any need or cancellation or termination of the document, there is no uncertainty about any process. In India, all issues in this domain are governed by the ‘The Powers of Attorney Act, 1882 ‘applicable to the entire country except for Jammu & Kashmir. An NRI has to sign this in front of either a notary or a consulate officer in whichever country he resides. Also, for proper sanctity in the case of NRIs, the document must be notarised and signed by the Indian High Commission and other such authorities. It is then sent to India for ratification, and within three months of the issuance, the endorsement process in India has to be completed. The Principal empowers the Agent with the right to carry out all legal acts on his behalf without restricting it to a particular transaction or act. Gives the Agent very broad powers to act on behalf of the Principal. A surcharge of 2% is needed to be paid now if this is granted to anybody who is not a blood relative. 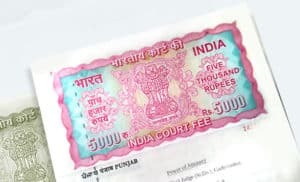 The Government is increasingly discouraging the issuance of Power of Attorney in India. If it is issued for purposes of sale of property, a form needs to be filled to mandatorily state whether the sale proceeds would be deposited in the owner’s account. The authority is restricted to act only on certain matters or only a particular kind of transaction to be carried out for the Principal. As a law firm dedicated to property legal advice, NRI Legal Services offers its clients a comprehensive, transparent system of legal assistance and sound lawyer advice for all matters related to property disputes – Power of Attorney being a vital component of the process.